It’s been a little bit quiet around here lately, it’s been a pretty rough few weeks for this little one. She battled a very aggressive staph infection on her leg for over 10 days, then we had to deal with a major asthma attack thanks to all the lovely Spring pollen flying around so we’ve just been focusing on making sure A was comfortable and getting through each day at a time. Thanks to her asthma attack, she ended up missing out on the first week of Spring Break fun and we tried to make it up to her over Easter weekend. 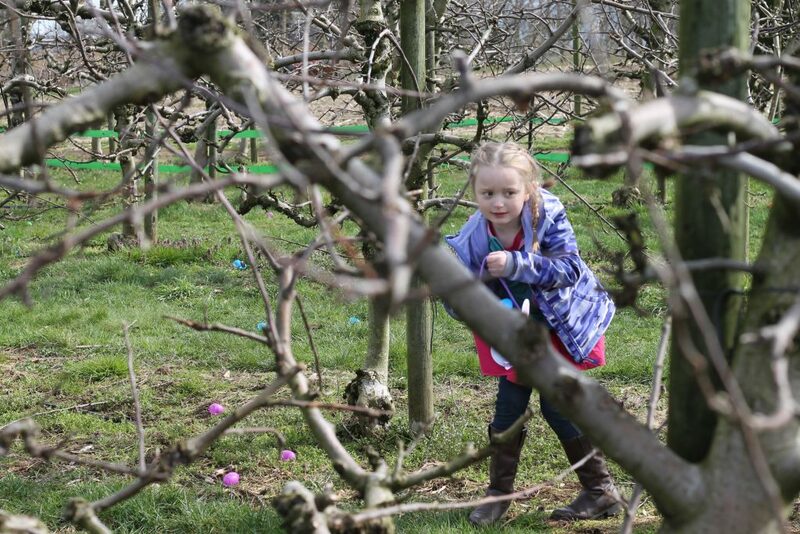 We had a lot of fun activities planned for Easter weekend, from Playdome on Good Friday, to swimming, her own Easter Egg hunt at home, but when an email popped into my inbox from the Applebarn inviting us to their first annual Easter Egg hunt, I knew we had to make time for a visit! We’ve shared our love for the Applebarn many times over but usually it’s only during pumpkin season! When we found out they were trying out an Easter Egg hunt, I was so excited. The weather can be pretty cruddy in October/November, and I know the farm is beautiful during the sunny weather. We arrived for our hunt around 10:30am and the first thing Alivia noticed was all of the fun spring decorations. 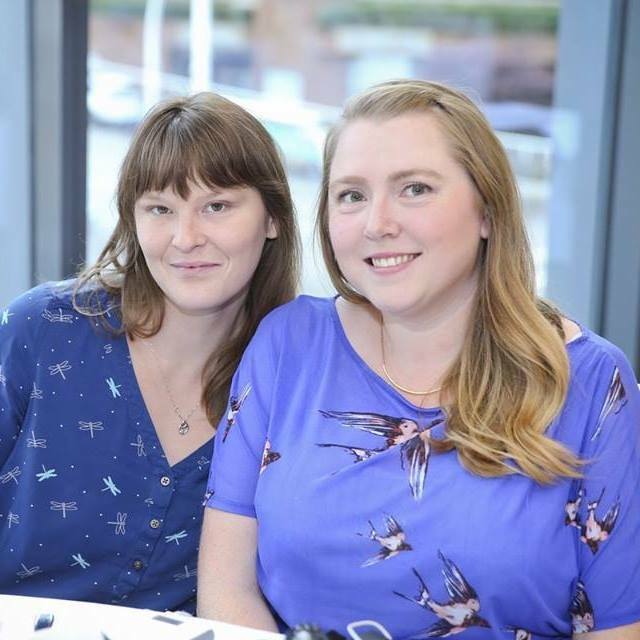 From beautifully planted Spring planters to country chic photo op set ups it was beautifully decorated for many – many photos! In previous years, we’ve said no to public egg hunts. 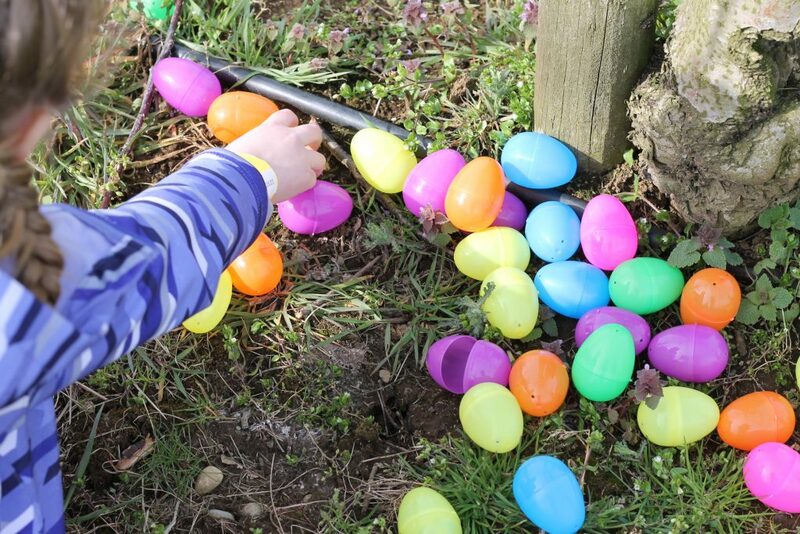 We had been to a couple that were a gong show with adults pushing kids out of the way, kids crying because they didn’t get very many eggs and just a lot of very mean faces and that isn’t how we roll on Easter weekend at our house. We wanted something less stress that still left happy kids. Alivia always worries that she won’t get any eggs because she isn’t very “fast” and doesn’t get excited. The idea of my kid being disappointed during an event that should be fun isn’t really something I’m willing to sign up for. 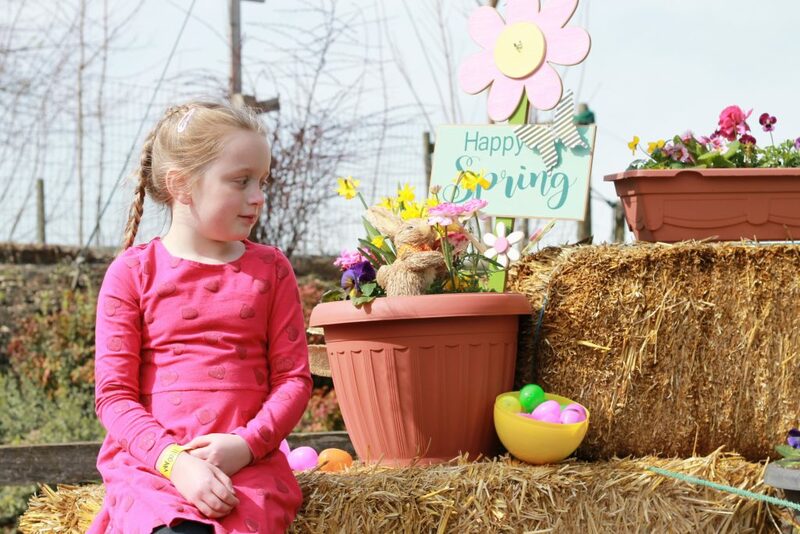 Taves Family Farms really thought it through with their egg hunt, they are parents to a small brood of kids themselves and only want to see happy faces! 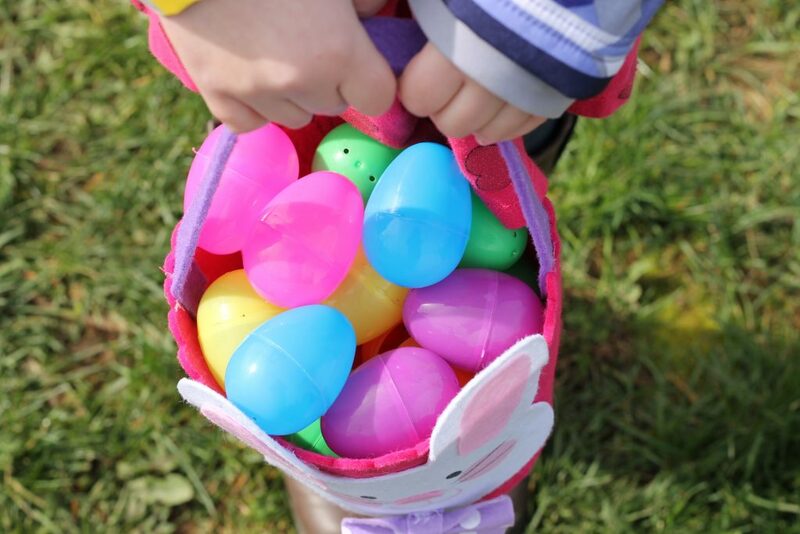 The egg hunt was super easy for kids big and small – all they had to do was collect 2 eggs of each colour, or fill their basket if they wanted and they could trade it in for a goody bag. Each kid left with a few treats and some small toys so there was many happy faces. 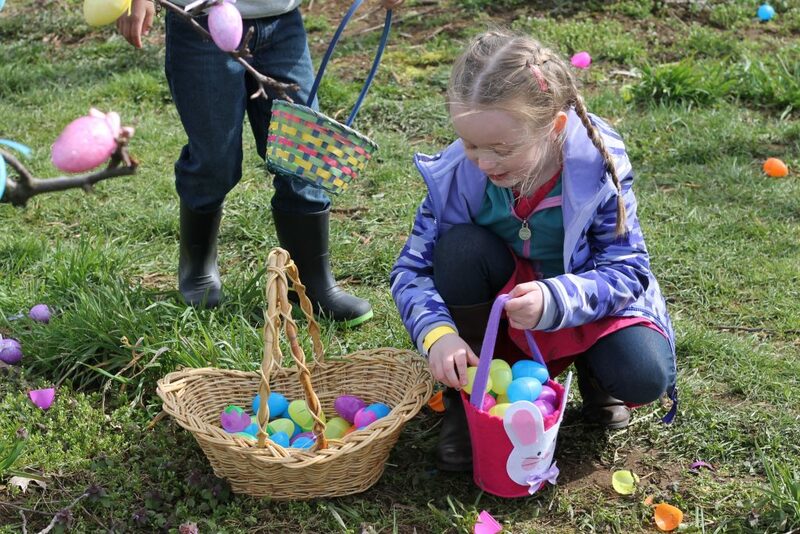 There was plenty of eggs to be found, and Alivia even joked that she found the “jackpot!” of eggs and helped other little kids around her fill their baskets with colours to get their treat at the end. She wandered throughout the patch looking for shiny ones hanging off the trees and loved the little piles. Once her basket was full and she enjoyed her walk it was time to head back to trade in her eggs! She was super excited to tell the staff how many eggs she had found and within seconds of picking her treat bag she was digging through it! She was more than impressed with her Silly Putty, treats and small toys. 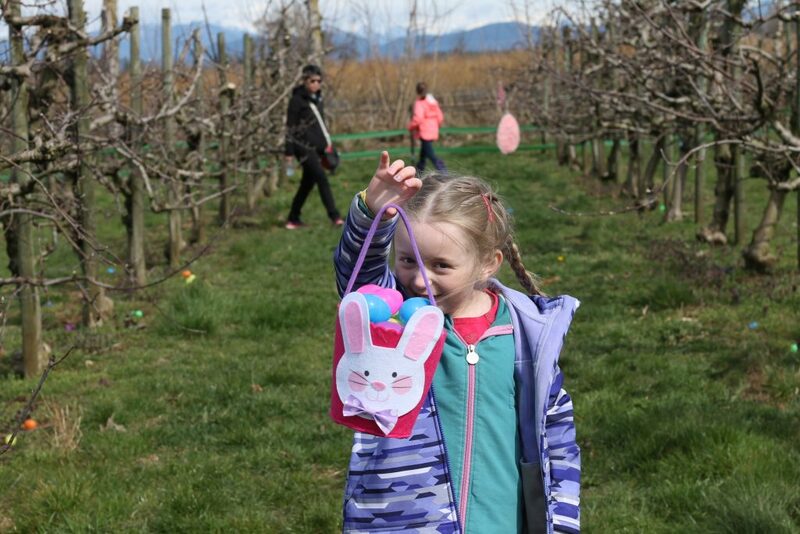 On top of the Easter egg hunt, the kids were given a scavenger hunt card where they could go around the farm collecting more treats from staff. I think what we enjoyed the most about this visit was how quiet it was. 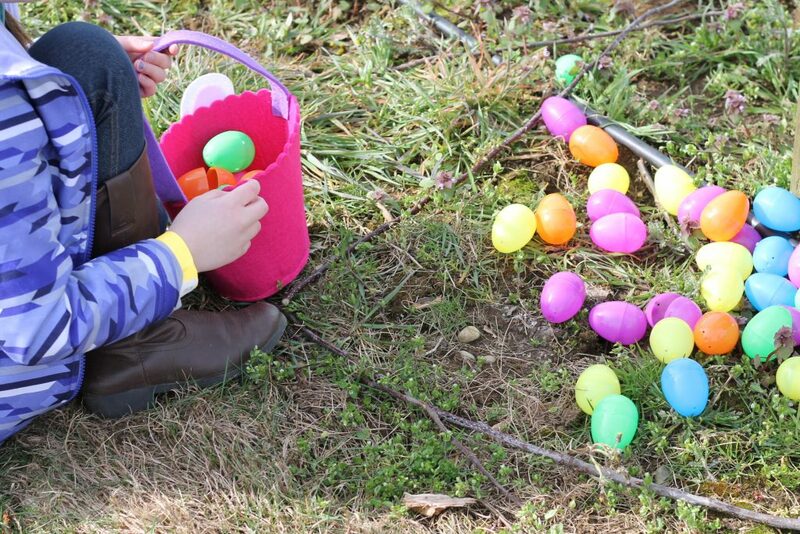 The egg hunts are timed, so there was no huge rush of people heading to the hay ride at the same time and kids had plenty of time to explore and find their eggs. We opted to walk back from the orchard and loved how everything was just starting to bud! We also lucked out with some serious sunshine! 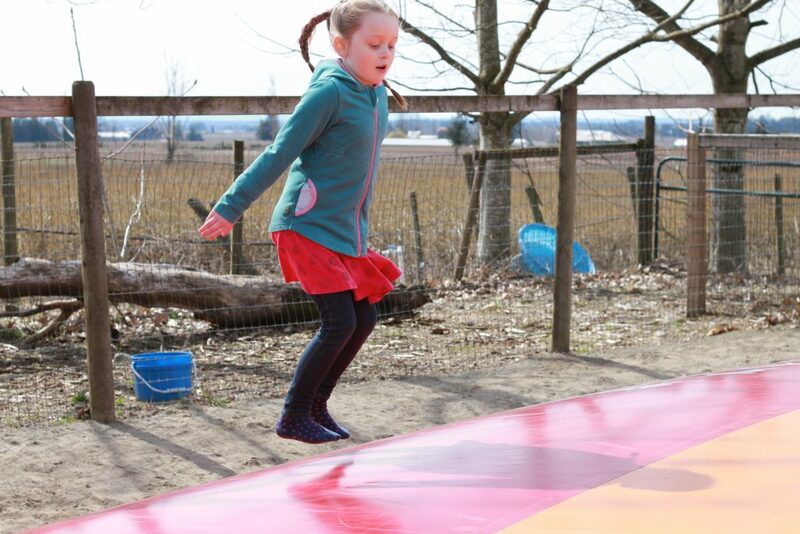 Included in the Easter event admission was access to all the year round fun at the Applebarn, including the go-carts, jumping pillows, petting zoo barn, zipline and more! 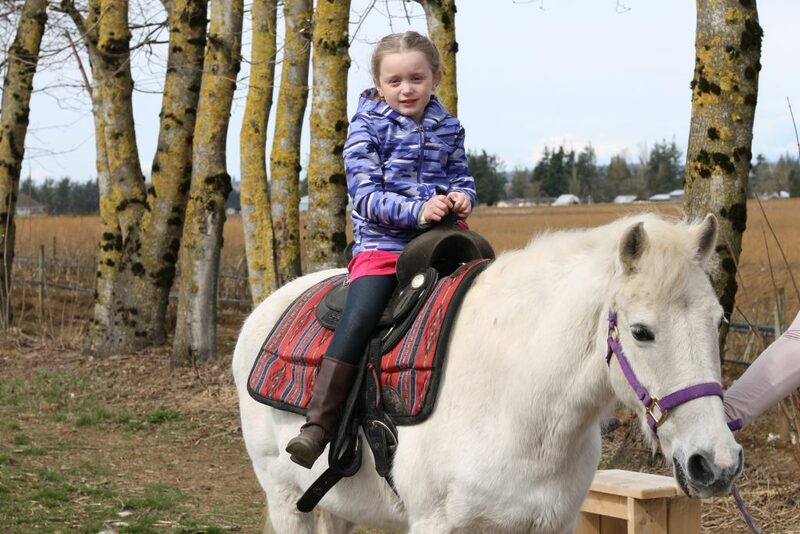 There is also the option to visit the pony ride area for $6 per ride – well worth it when you see how happy the kids are when they get to pet and talk to the sweet ponies. Alivia never lets us leave the Applebarn without firing a few shots off the pumpkin cannon, and since it isn’t pumpkin season.. it’s the pollen blaster now! 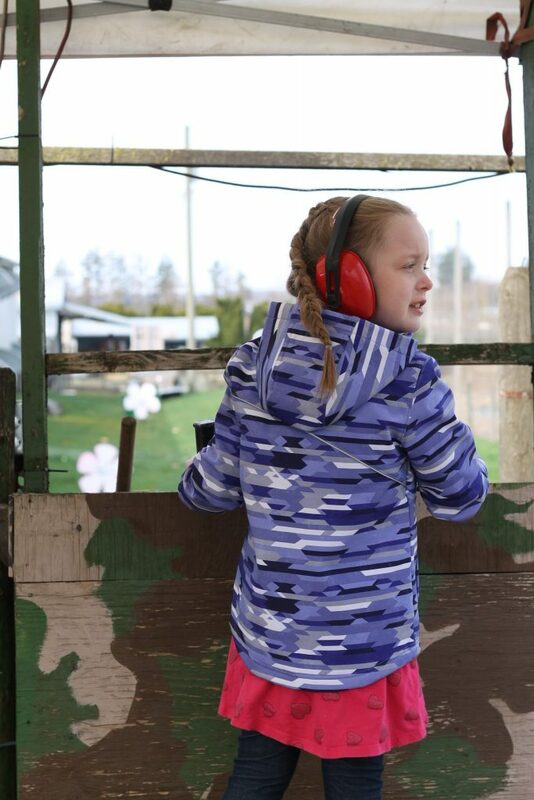 Still tons of fun, though a bit loud so if you have littles make sure to stand back and cover their ears when someone is firing. It can spook them but it is a ton of fun. 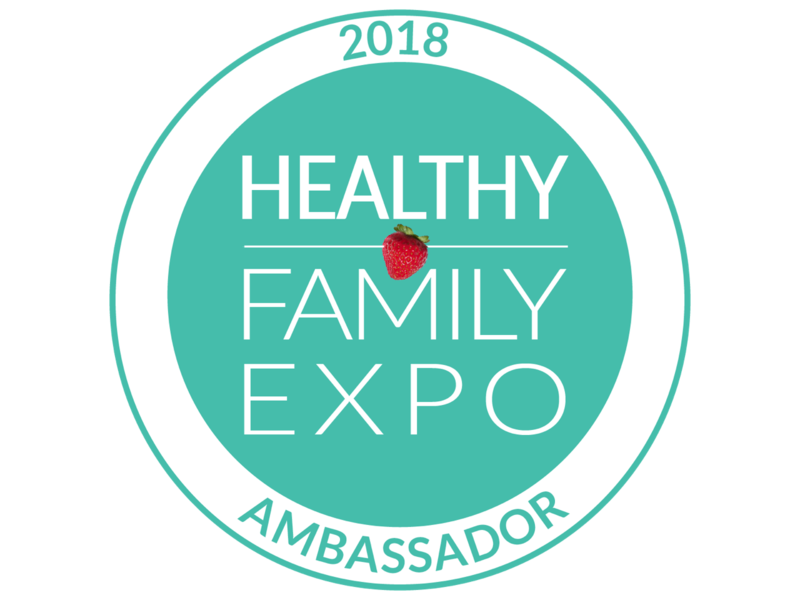 We definitely felt this was a great event for families and very reasonably priced, you are welcome to bring in your own food and snacks or they have a pretty well stocked concession with snacks, food and drink and lots of delicious apple goodies inside the Country Store. 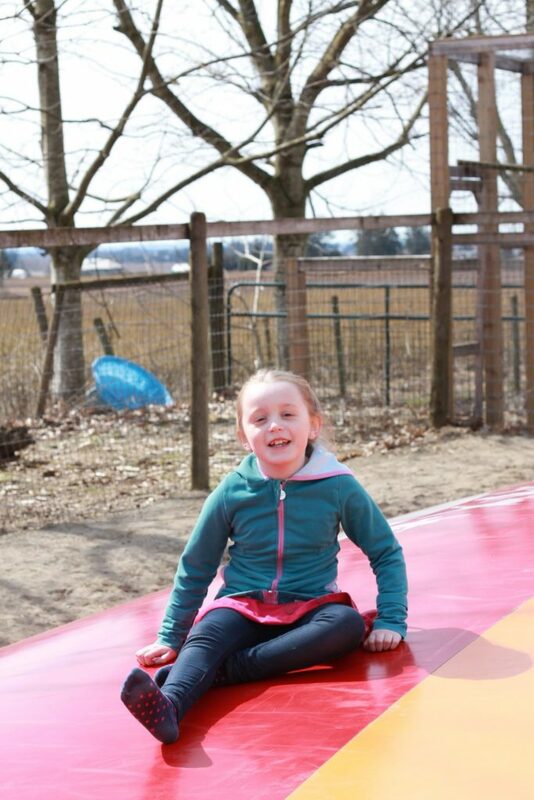 For a family of 3, with hay rides and the egg hunt it was about $20 and included a full day of adventure on the farm and lots of smiles. Very much worth the stress free day! Though we definitely missed the fall feel of the farm with all the pumpkins set up, we really loved our visit and can’t wait for apple and pumpkin season! The weather was perfect the entire day and with the sun shining, kids were jumping non-stop on the giant pillow trampolines and flying down the slides. It was a much calmer environment without the rush for the perfect pumpkin and definitely and event we will come back for. Sounds like lots of fun! So much to do! 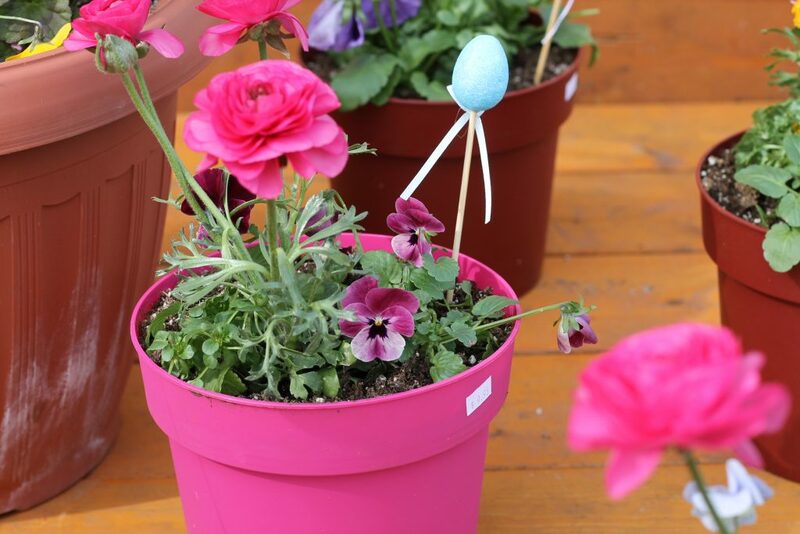 Egg hunts at so much fun ! It’s so sad to hear about her first week… it’s tough to see them suffer like that! She’s very blessed to have a mom that cares enough to want to make it up the next week! 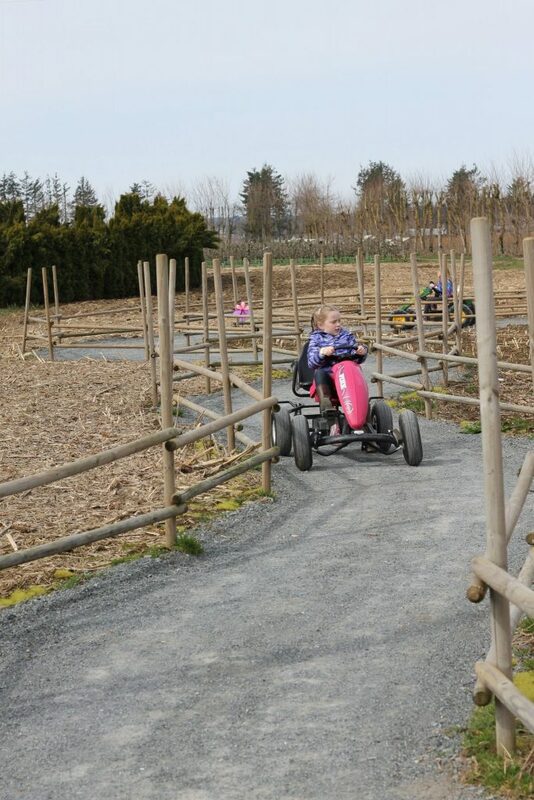 It sounds like a lovely day at the Taves Family Farm, great review! Looks like a great outing location! This place looks like it has a full day of fun things to do. We missed the egg hunt but the kids love this farm since we went last year! Celebrating the various seasons at farms is an important aspect of our lives. We do enjoy it very much. Sounds like a lovely time at Taves Farm!! They did an awesome job at the Easter Hunt and many happy kids had a fabulous day! Thanks Taves Farm! Wonderful! What a great way to spend a day, it looks perfect! So fun! I definitely want to visit Taves Family Farm.